EQ-99XFC LDLS, Compact, Long-Life, High-Brightness, Broadband Laser-Driven Light Source with Fiber-Coupled Output. Advanced imaging & analytical spectroscopy applications in the life sciences and materials sciences need light sources capable of providing extremely high brightness across a broad wavelength range. Traditionally, multiple lamps (Halogen/ Tungsten, Xenon-arc, Deuterium) have been used to cover this broad spectral range. However, combining multiple lamps is costly and optically inefficient, and the use of electrodes within these lamps limits their ability to achieve the high brightness or power needed for the most demanding applications. Furthermore, traditional electrode-driven light sources have short life, need to be changed frequently, and during their life the lamp output declines constantly. To address these problems, Energetiq has developed a revolutionary single-light source technology called the LDLS™ Laser-Driven Light Source that enables extreme high brightness with a relatively flat spectrum, from deep ultraviolet through visible into the near infrared, combined with life-time an order of magnitude longer than traditional lamps. Researchers using light for imaging and analytical spectroscopy in a variety of applications in the life sciences and materials sciences need light sources capable of providing extremely high brightness across a broad wavelength range. Traditionally, multiple lamps (Tungsten/Halogen, Xenon-arc, Deuterium) have been used to cover this broad spectral range. However, combining multiple lamps is costly and optically inefficient, and the use of electrodes within these lamps limits their ability to achieve the high brightness or power needed for the most demanding applications. Furthermore, traditional electrode-driven light sources have short life, need to be changed frequently, and during their life the lamp output declines constantly. To address this problem, Energetiq has developed a revolutionary single-light source technology called the LDLS™ Laser-Driven Light Source that enables extreme high brightness over a broad spectral range, from 170nm through visible and beyond, combined with lifetimes an order of magnitude longer than traditional lamps. 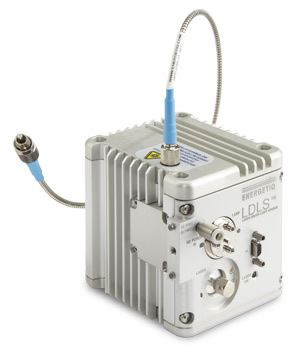 Energetiq’s innovative LDLS technology uses a CW laser to directly heat a Xenon plasma to the high temperatures necessary for efficient deep ultraviolet production. In traditional approaches such as arc and deuterium lamps, the brightness, UV power, and lamp lifetime are limited by the use of electrodes to couple power to the plasma. The electrodeless LDLS technology creates small, high brightness plasma that allows efficient light collection, broad spectral range from the deepest UV through visible and beyond, and long lamp life.